When you take a step, it’s perfectly natural for your foot to roll inwards slightly. The movement even has a special name: pronation. It occurs when your weight is being transferred from your heel to the front of your foot, temporarily flattening your arch. However, if your foot rolls inwards in an exaggerated way and so is forced out of alignment with your ankle, it’s overpronating. This form of abnormal pronation, which is most often seen in people with fallen arches, puts the inner edge of the foot (including the big toe) under too much strain. Overpronation destabilises the feet, as well as impairing their ability to cope with the impact of striking the ground. That’s why overpronators are prone to foot fatigue, injury and painful conditions such as plantar fasciitis and bunions. The good news is that you can tackle the problem with the right shoes. You just need to know what to look for. Here’s our guide to footwear that reduces overpronation. If you’re an overpronator, you’re likely to benefit from what footwear manufacturers call stability shoes and motion control shoes. Why? Because they’re designed to provide excellent support and shock absorption while minimising the inward rolling motion. As ‘stability’ and ‘motion control’ don’t sound particularly exciting, it’s easy to assume that shoes for overpronation will be boring, clunky and ugly or that your choice will be extremely limited. Years ago that was perhaps the case, but not anymore. For example, the sports shop Run and Become has numerous eye-catching trainers especially for overpronators. So you don’t need to compromise on style when aiming to reduce your level of overpronation. Several features contribute to the overall effectiveness of anti-overpronation shoes. Typically made of EVA foam, the midsole is sandwiched between the inner and outer soles of a shoe. It has a crucial role to play in cushioning the foot and absorbing shock. Ideally, you want footwear with firm, supportive midsoles that’ll make your feet more stable and comfortable. If you’re a runner who enjoys pounding pavements, look for midsoles that incorporate gel or pockets of air, as they’ll provide extra cushioning. Dense sections of foam in the midsole are known as medial posts. They’re carefully positioned to increase the amount of arch support (and sometimes heel support) the shoe provides. 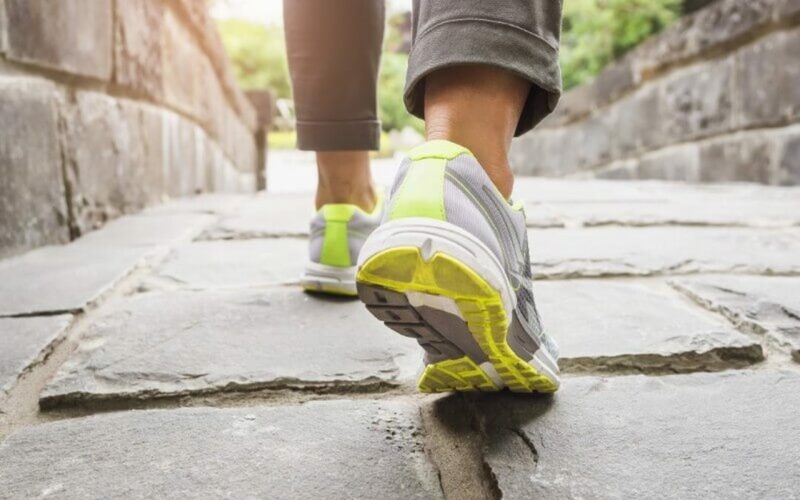 Medial posts can be advantageous for overpronators with flat feet, as they help arches that aren’t as robust as they should be to cope with the impact of walking and running. Heel counters made of leather or plastic stiffen the backs of shoes. By holding your heels firmly in place and helping to ensure that your footwear fits snugly, they can decrease the inward rolling motion. Try pressing down on the back of a shoe with your thumb – if you can squash it, it isn’t strong enough for an overpronator’s needs. The higher your footwear’s heels, the more unstable your feet and ankles will be. So, when shopping for shoes to curb overpronation, avoid heels that are more than two inches high. If you suffer from severe overpronation, pay close attention to your footwear’s shape. If the inner edge of the sole is slightly curved, it may not be supportive enough to prevent your feet rolling too far inwards. Look instead for straight-lasted shoes, which are more symmetrical, stiffer and provide superior motion control. To optimise the supportiveness and stability of your footwear, our London podiatrists can provide prescription orthotics. With these custom-made shoe inserts, specially moulded to reflect the unique shape of your feet, you can boost your foot function while further reducing overpronation. What’s more, if you haven’t yet had a formal diagnosis of overpronation, we have the expertise and gait analysis technology required to perform a detailed biomechanical assessment. For specialist treatment and advice to help you overcome overpronation, please call Feet By Pody today on 0207 099 6657 or book an appointment online.